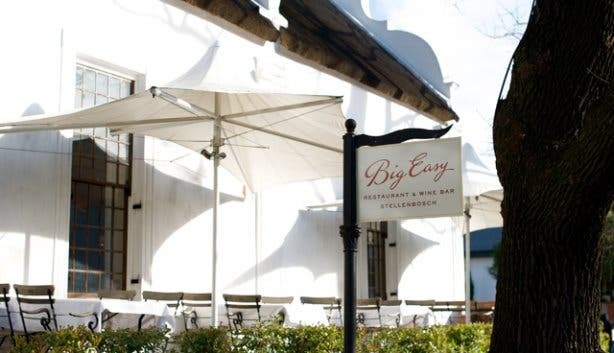 Time stops in Stellenbosch; not that it’s a sleepy town; no it’s more the tangible history of the town that creates the feeling. Deep storm gutters run along the sides of the roads, Cape Dutch architecture is dominant, and ancient oaks provide dappled shade for people dining on white-washed stoeps. 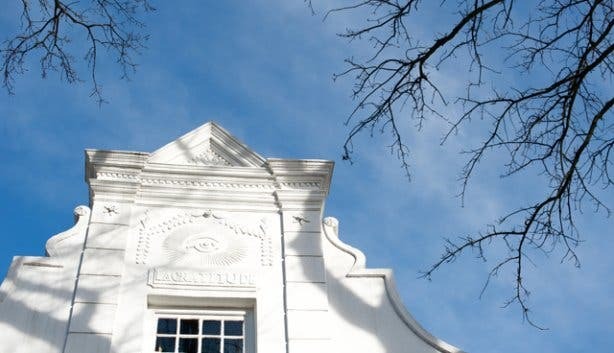 One such building with the ubiquitous stoep is La Gratitude; built in 1798 by the first reverend of Stellenbosch. Interestingly, the wine cellar has been preserved; and it was where the communion wine for the town was once made. The rambling property on Dorp Street is a mix of Cape Dutch, Georgian and Victorian architecture and is fondly known as ‘The Grand Old Lady. And it’s inside this national monument where we’re having lunch today. Not merely a converted farmhouse, but rather a Cape Dutch manor, the building splits off into various rooms. 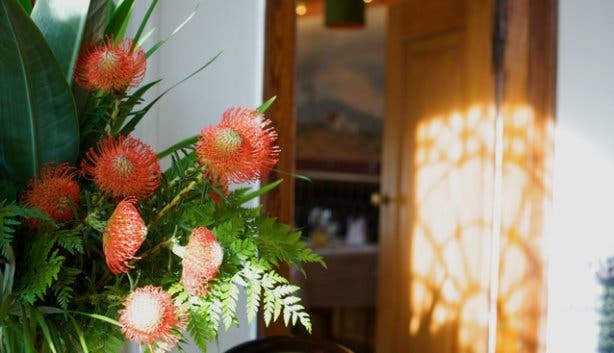 “Each area has a different theme,” says Jean Engelbrecht, one of the five owners of the restaurant. At the moment we’re in the ‘Karoo Bar’, so named for another one of the owners, Johann Rupert, and his love for the Karoo. He owns extensive farmland there and a beautiful landscape of a pastoral scene stretches across one wall. 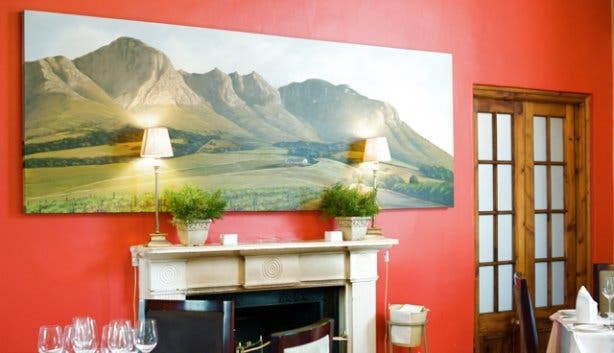 Some of the partners also own wine estates including; Rupert wines with L’Ormarins and Anthonij Rupert wines; Rust en Vrede; Guardian Peak; Audacia Wines, and of course, Ernie Els Wines, the name of the restaurant is after all, the famous golfer’s nickname. With the owners’ vinous credentials, it comes as no surprise that the experience here is seriously wine-driven. 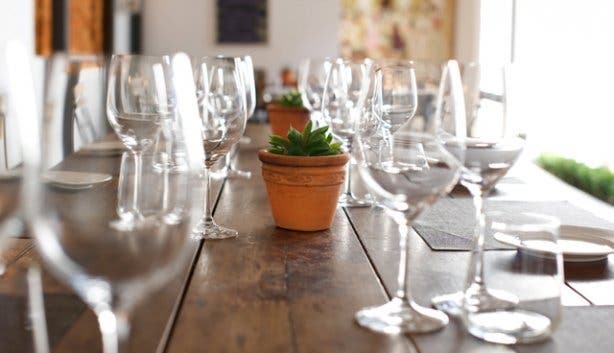 With over 170 wines on the wine list, an ever evolving wines-by-glass offering plus a wine shop; here you can you do tutored tastings and purchase all of the aforementioned estate’s wines at cellar door prices. The waiters are also all wine-trained, so expect knowledgeable and astute service. And, you’re more than welcome to pull up a table in the courtyard and do a wine-tasting there. But, I’m getting ahead of myself. First Jean is keen to show us around. 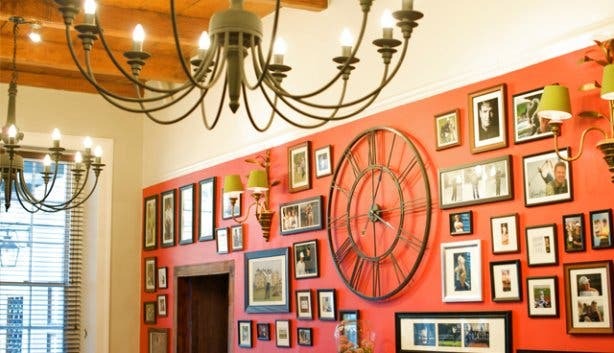 There’s a ‘Wine Estate’ room, where photos hang on the walls of the various partners’ estates. This room is subdued and elegant; decorated with detailed midnight-blue wallpaper, white wing-backed chairs, and large gold-framed mirrors. 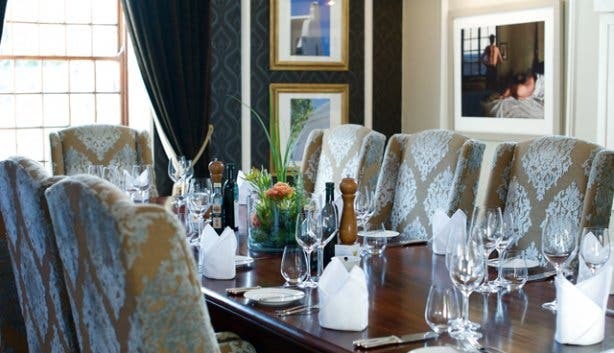 There’s also a ‘Golf Estate’ room as well as the ‘La Gratitude’, which is just the place for private dining, whether it be a wedding celebration or business power dinner. 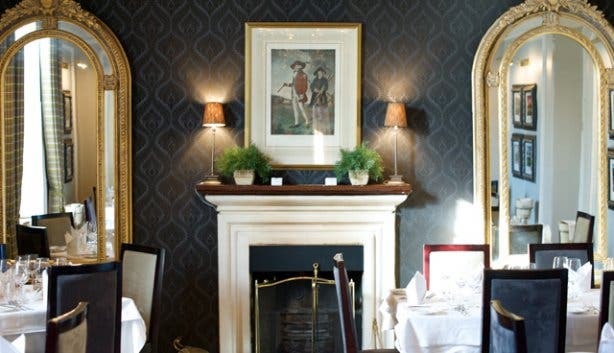 Throughout the restaurant the walls are covered in an eclectic collection of art and rich fabrics. And, the feeling truly changes as we move from room to room. The back courtyard has a glass ceiling, from which box-shaped iron chandeliers hang. Outside of this there’s alfresco dining by a fountain. Guests are spoilt for choice here. You can literally choose the feeling you want, whether it’s a formal food and wine pairing in a grand room. Or a light lunch in the sunshine. We’re not quite finished our tour yet. Jean leads us to an outside door and up to a thatch-roof attic. This is the Founder’s Club. The aim is to have 150 members, who are all in business, and to use the space as a networking platform. It’s also, used as a function area and I can see why. The low thatch ceilings create an intimate atmosphere, and the furnishings are exquisite; from polished brass antiques to roomy leather couches. It also has its own bar area, and canapés from the restaurant can be served up here. 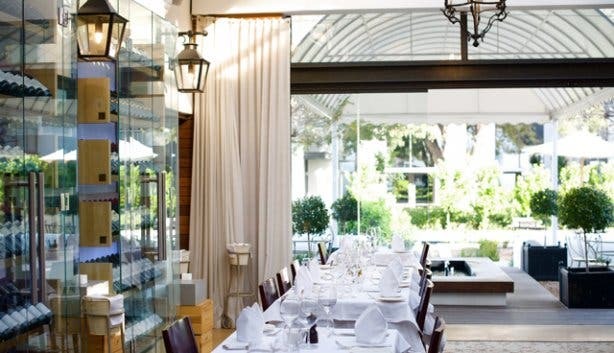 Over glasses of Ernie Els’s new white releases, a sauvignon blanc and a chenin blanc, we pore over the lunch menu. 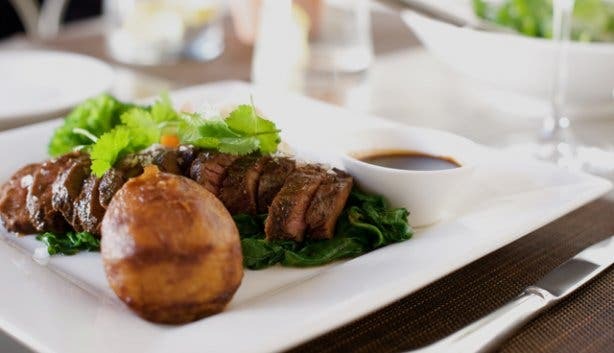 The chef, Craig Backhouse has created a bistro-style menu for lunch and for dinner it’s fine dining. There’s a also a list of blackboard specials, which changes regularly. Pierre Verneau, the French maitre’d, orders for us with practiced ease. We start with wild mushroom risotto made even richer with truffle cream. Soon we’re tucking into kingklip with soft polenta that’s been infused with olives and sun-dried tomatoes. Our other dining companion has perfectly seared venison. Pierre says that a way to describe the restaurant would be an ‘upmarket steakhouse’. This makes sense considering the serious reds on the wine list. 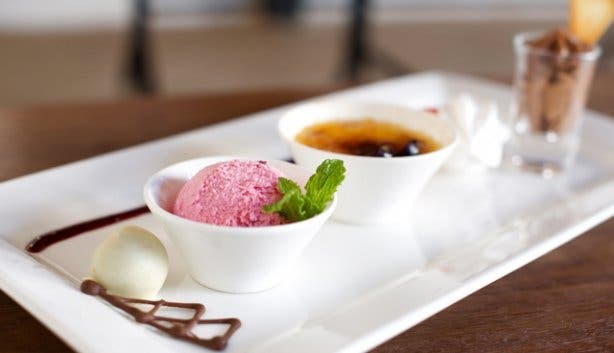 Dessert is a tasting plate of chocolate mousse, crème brûlée, bon bons and ice cream. The sunny afternoon stretches on. And if it was the intention of the restaurant to make it feel as if time stands still. Well then I can happily say, I think they’ve done their job perfectly. The restaurant also serves a cracking breakfast. Get there at 7:30am for a farmhouse-style brekkie or even a health breakfast. We visited Ernie Els Wine Estate and discovered a chipping competition and that they excel in red wine making.